Did you ever go to your character interface and check out your ninja characters stats? These stats means lot to position yourself stronger in Naruto Online game. 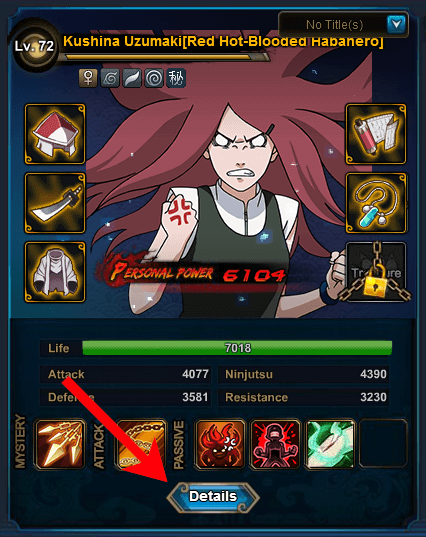 Once you go to your Naruto Online game, click on the “Character Interface”. Once you’re in the Character interface select any of your ninja characters. You will see something like on the above screenshot when you click on any of your Ninja character. Click on “Details” as showed on the screenshot. Once you click on “Details” you will see exactly the same things like the screenshot above. These are your ninja character stats. I will provide explanation on what each of those stats mean in the table below. Life Maximum Life point of your character. Attack The potential Taijutsu damage output when your ninja character uses Taijutsu based attack in the battle. Defense The potential amount of incoming Taijutsu damage to your ninja will be reduced. For example, your opponent’s ninja is causing 7,000 Taijutsu damage and your ninja’s Defense is 3,500, so your ninja will only suffer 3,500 Taijutsu damage. 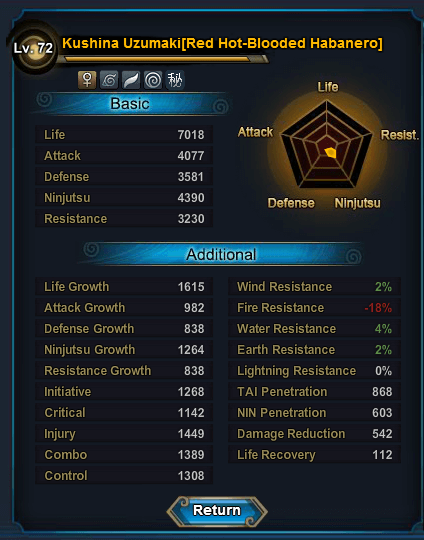 Ninjutsu The potential Ninjutsu damage output when your ninja character uses Ninjutsu based attack in the battle. Resistance The potential amount of incoming Ninjutsu damage to your ninja will be reduced. Life Growth The potential amount of Life point that increases when your ninja level ups. Attack Growth The potential amount of Taijutsu damage that increases when your ninja level ups. Defense Growth The potential amount of Defense (Taijutsu damage reduction) that increases when your ninja level ups. Ninjutsu Growth The potential amount of Ninjutsu damage that increases when your ninja level ups. Resistance Growth The potential amount of Resistance (Ninjutsu damage reduction) that increases when your ninja level ups. Initiative The amount of Initiative will decide which ninja attacks first in battle. Critical Increases the rate of Critical hit while reducing the rate of suffering from Critical hit. Injury Increases the rate of Critical hit damage while reducing the rate of suffering from Critical hit damage. Combo Increases the rate of Combo between Standard Attacks while reducing the rate of suffering from Combo attacks. Control Increases the success rate of Crowd Control while reducing the rate of suffering Crowd Control abilities. Wind Resistance Increases the resistance againts Wind Attribute attacks. Fire Resistance Increases the resistance againts Fire Attribute attacks. Water Resistance Increases the resistance againts Water Attribute attacks. Earth Resistance Increases the resistance against Earth Attribute attacks. Lightning Resistance Increases the resistance against Lightning Attribute attacks. Taijutsu Penetration Taijutsu damage that ignores the Defense of opponent’s ninja. It will be True Damage. Ninjutsu Penetration Ninjutsu damage that ignores the Resistance of opponent’s ninja. It will be True Damage. Life Recovery The total amount of Life point recovered each round during battle. You can increase your ninja’s Life Growth, Attack Growth, Ninjutsu Growth, Defense Growth and Resistance growth by Ninja Awakening. I’ll definitely write an article on Ninja Awakening in future. Initiative, Critical, Injury, Combo and Control can be increased using the following methods. All the resistance can be increase by improving and leveling up your Ninja Tools which you get by completing Team Instances. These are the most important things you need to know about Ninja stats when you’re playing Naruto Online game. Please do let me know what type of guide you’re looking for by commenting below. I will try my level best to do my research and come up with the best guides. P.S: I have a big request to you: Please share the blog post on your social media networks if you find it valuable.